Your pursuit of titanic triceps just got simpler. Learn the 8 things you should never do on arm day if you really want to unleash some massive growth! Triceps may be one of the easier body parts to train—after all, you basically just have to extend at the elbow—but that doesn't mean you can't make a slew of mistakes that could compromise your gains. We've collected eight of the most common things you should never do when training triceps, to help you focus on what you should do for unreal results. Stop holding back your arm growth by recognizing these no-nos and learning how to hit your triceps effectively! This is a common mistake, especially among beginners who don't yet understand that not all exercises are created equally. Newbies often start their triceps workout with press-downs, which are a single-joint exercise. However, single-joint movements limit the amount of weight you can push. Unless you're following a very specific training protocol, the best choice for your first triceps movement is actually a heavy, multijoint exercise. You likely already follow this same thinking with other body parts like chest and legs. When two sets of joints are working (for triceps, that would be shoulders and elbows), you recruit more muscle tissue and can therefore lift heavier weights than when hitting isolation movements. Though you lose some of the targeting of single-joint movements, your goal in your first exercise is to push the most weight for the greatest overload. Multijoint exercises for the triceps include weighted bench dips, the triceps-dip machine, close-grip bench presses, and parallel-bar dips, though with the last one you might have to use a weight belt to ensure failure in the muscle-building rep range (8-12). Single-joint movements like press-downs can be done first to warm-up the elbows, sure, but those sets shouldn't be taken to muscle failure. When putting together your triceps routine, there are plenty of exercises you can choose from, but only one kind most effectively targets the bulky long head. The long head attaches above the shoulder joint, which means it doesn't get fully stretched unless your arms are positioned overhead. When a muscle is fully stretched, it's capable of a stronger contraction than one that's not fully stretched. That's why an arms-overhead movement should be included in your triceps routine. There are any number of types of arms-overhead movements you can do, including overhead extensions with an EZ-bar, dumbbells, cables (rope or EZ-bar), or even machines. The key is to lock your upper arms beside your head so that your elbows point straight up—they shouldn't sway from this position. Your elbows simply act as a hinge with no other movement taking place. Single-joint exercises for the triceps all have one thing in common: elbow extension. The elbows go from a highly bent position to fully straightened. However, if you allow your elbows to flare out, you reduce the effectiveness of the motion. "If there's one tip that applies to virtually every exercise in terms of technique, it's that to truly isolate the muscle and minimize the involvement of surrounding muscles such as the chest and deltoids, you need to keep the elbows in tight as possible," write Joe Wuebben and Jim Stoppani, PhD, in "Stronger Arms & Upper Body".1 "Allowing them to flare out will, in most cases, reduce the effectiveness of the exercise." When doing overhead extensions, close-grip bench presses, machine triceps dips, parallel-bar dips, or other triceps movements, be conscious of elbow flare and try to keep your elbows as tight to your body as possible. This is a common form error, even among more experienced lifters. 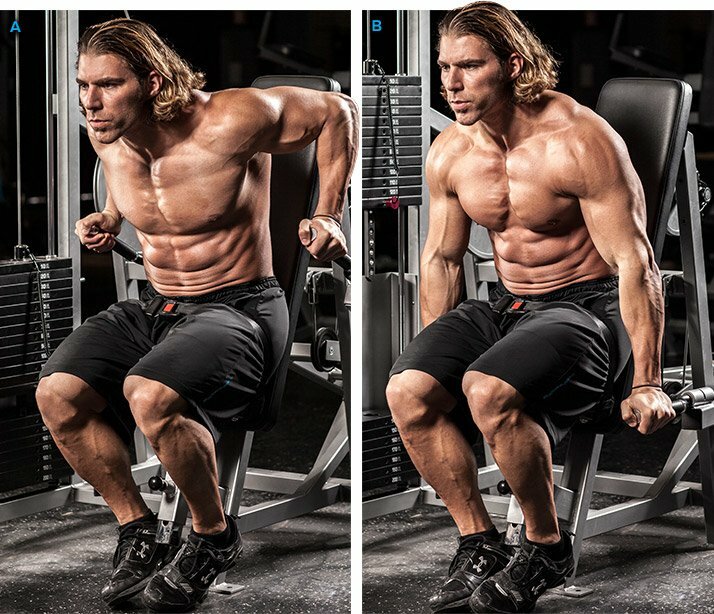 Essentially, dropping the elbow during the motion turns a single-joint movement that emphasizes the lateral triceps head into a multijoint one that also recruits the delts. That limits the effectiveness of the movement for triceps development, because some of the workload has shifted to the delts. To get this isolation movement right, lock your elbow by your side so that your upper arm is parallel with the floor. Hinging at the elbow, fully straighten your arm so that now your entire arm is parallel to the floor. As you lower the weight, don't allow your elbow to drop. Here's another case in which a single-joint movement is mistakenly turned into a multijoint one. Press-downs involve only elbow extension: the upper arms are locked by your sides to better isolate the triceps lateral head. But allowing the elbows to stray from your sides during the eccentric motion—a technique flaw among many lifters—again recruits the shoulders into the movement. Once again, bringing in another muscle group limits the stimulus on the triceps, so keep your elbows tight to your sides and focus wholly on triceps recruitment. If your primary goal is to continue piling on weight, you might inadvertently be committing this mistake. In the second point, I mentioned that a muscle is capable of a stronger contraction when it's fully stretched. Fully stretching the triceps also works the muscle through its full range of motion, which leads to greater overall development. But in your haste to increase the load, you can easily sacrifice range of motion, meaning you end up doing only partial reps. Partial-rep training is an advanced tool that can be done in addition to full-range reps, but not in place of it. You commonly see partial reps done on the triceps dip machine and press-downs when using a weight that's too heavy. In these cases, the eccentric motion is stopped well short of the fully stretched position. The answer is to simply lighten the weight and be aware of taking each rep to a position in which your elbows are bent about 90 degrees. Again, unless you're following a very specific training prescription, you always want to train larger muscle groups before smaller ones. Because the triceps are fairly small, but are vitally important in pressing motions, they should be fresh and not be prefatigued before you dive into heavy presses. To bench or military press maximal weights, you simply don't want to train your triceps immediately before chest or shoulders. Extending your elbows requires that you fully straighten your arms, but alas, you don't want to lock them out. Locking out shifts the stress from the triceps to the elbow joint itself. With a heavy load and momentum, this can actually damage the joint. "Locking out any joint shifts the force from the muscle to the joint itself, which is counterproductive to building muscle," says Guillermo Escalante, DSc, ATC, and co-owner of SportsPros Personal Training/Physical Therapy Center in Claremont, CA. "Not only is this potentially harmful for the joint, but it also takes tension off the muscle, defeating the purpose of the exercise. Save your joints and improve the muscle recruitment in the targeted muscle by not locking out the joint. Instead, go through a full range of motion just before locking out the joint."